Friends, I present Thanksgiving in a baking dish. Let’s do this! This easy recipe requires just 10 ingredients (2 more if adding these dreamy balsamic mushrooms!) and simple methods to make. The base is a simple mixture of vegetables and lentils simmered with fresh thyme in vegetable broth until tender and flavorful. Next up? If you dare, these balsamic-glazed portobello mushrooms, which add another layer of hearty goodness to this pie. For topping, in place of traditional white potatoes (like in my 1-Hour Vegan Shepherd’s Pie), I went for sweet potatoes (the best potatoes, in my opinion). Simply boil then mash with a little salt and coconut oil. Then it’s time to layer up all of this goodness. First, lay down the lentils and vegetables. Then add the balsamic portobellos (optional but dreamy!). And then top with fluffy mashed sweet potatoes. Swoon! Just 20 minutes in the oven and you’re good to go! 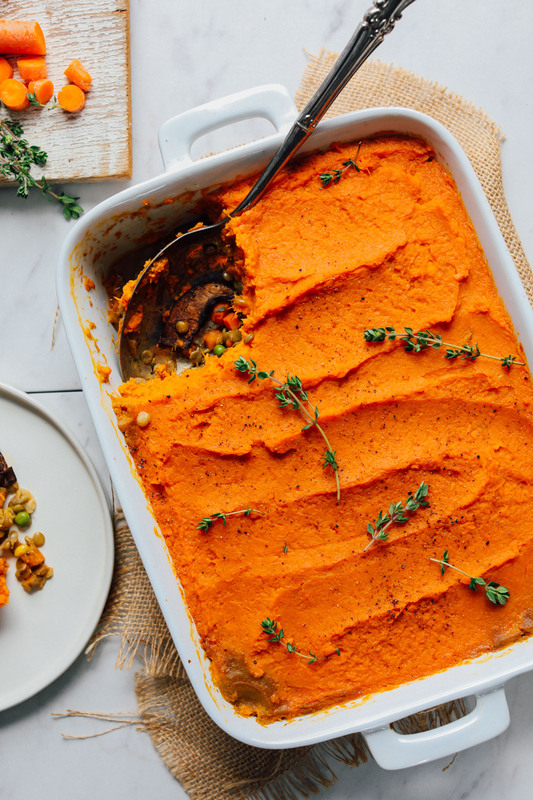 This would make the perfect entrée for holiday gatherings or hosting a crowd of mixed eaters – plant-based folks and meat-eaters alike will love this one! It’s also ideal for making in advance and reheating throughout the week for quick meals on the go (hello, best leftover lunch ever). While delicious on its own, it would also pair well with my Creamy Kale Salad with Shallot and Chickpeas, Fluffy Spelt Rolls, Vegan Gluten-Free Biscuits, and pretty much everything in this Vegan Thanksgiving Round-Up! If you try this recipe, let us know what you think! Leave a comment, rate it, and don’t forget to tag a photo #minimalistbaker on Instagram so we can see your holiday spread. Cheers, friends! 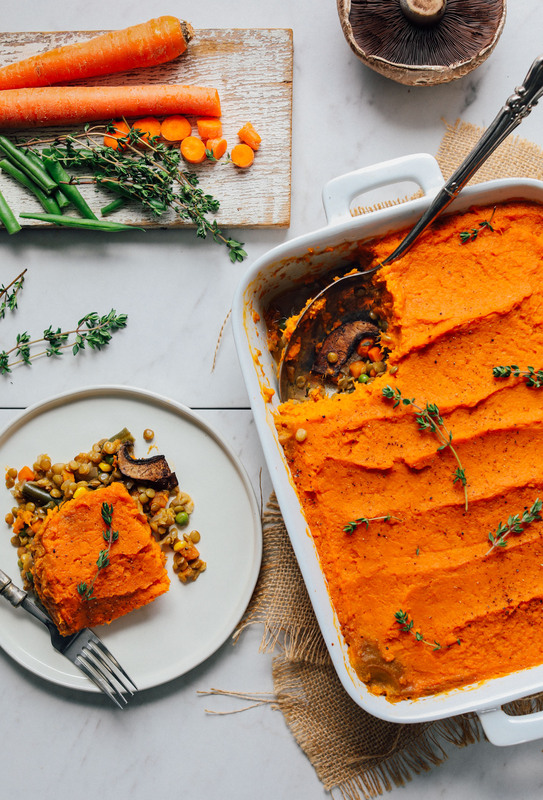 A colorful take on classic shepherd's pie with lentils, vegetables, and a fluffy sweet potato topping. You'll love this 10-ingredient plant-based meal! Place sweet potatoes in a large pot and fill with water until they’re just covered. Bring to a boil over high heat. Then reduce to medium-high heat and cook for 15-20 minutes or until they slide off a knife very easily. Once cooked, drain and transfer to a large mixing bowl. Use a masher or fork to mash until smooth (see photo). Add coconut oil and season with salt and pepper to taste. Depending on the sweetness of sweet potatoes, add a bit of maple syrup to taste (optional). Loosely cover and set aside. While potatoes are cooking, preheat oven to 425 degrees F (220 C) and lightly grease a 9x13-inch (or similar size) baking dish (or more baking dishes, as needed, if altering batch size). If adding (optional), add portobello mushrooms to a shallow dish or large Ziploc bag. Top with balsamic vinegar, oil (optional), salt, pepper, and garlic. Toss to combine and let marinate for 5 minutes. Next heat a large pot over medium heat. Once hot, add oil, onions, and garlic and sauté until lightly browned and caramelized - about 4-5 minutes. Add a pinch each salt and pepper. Then add lentils, vegetable broth, and thyme and stir. Bring to a low boil. Then reduce heat to simmer. Continue cooking until lentils are tender (20-30 minutes). (If adding mushrooms) while lentils cook, heat a large skillet over medium heat. Once hot, add a dash of oil and the mushrooms with their marinade. Spread into an even layer and cook on one side for 2-3 minutes. Then carefully flip and cook on other side for 2-3 minutes. Then remove from heat and set aside. In the last 10 minutes of cooking the lentils, add the frozen veggies, stir, and cover to meld the flavors together. Drain off any extra vegetable stock (there shouldn't be much). Taste and adjust flavor as needed, adding more salt and pepper for overall flavor. 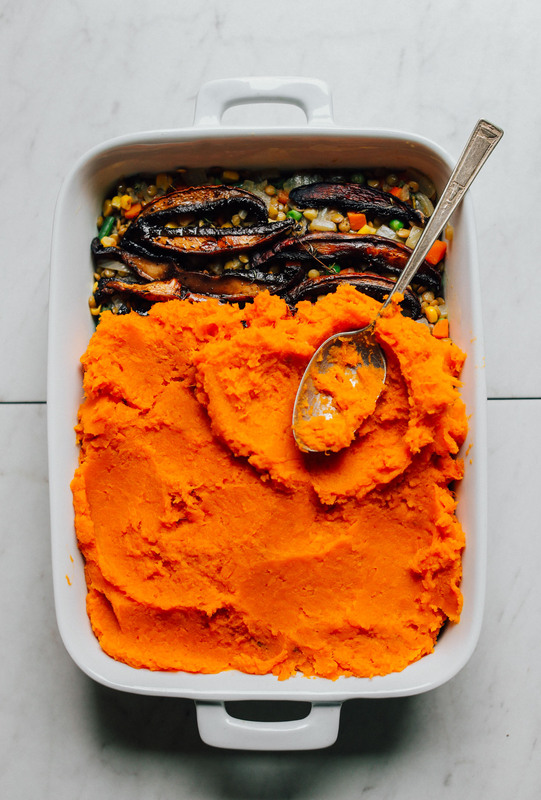 Transfer the lentil mixture to your oven-safe baking dish and top with portobello mushrooms (optional) then mashed sweet potatoes. Smooth down with a spoon or fork and season with another crack of pepper and a little sea salt (and more thyme if desired). Set on a baking sheet to catch any overflow and bake for 20 minutes or until the potatoes are lightly browned on top and the edges are bubbling. Let cool briefly before serving. The longer it sits, the more it will thicken. Let cool completely before covering, and then store in the fridge up to 4-5 days or in the freezer up to 1 month. Reheats well in the microwave or in the oven. *3 large sweet potatoes is equal to ~5 small sweet potatoes. *You can sub 1 tsp dried thyme per 2 tsp fresh thyme. *Nutrition information is a rough estimate calculated with 3 Tbsp of oil total, and without the baked mushrooms or optional maple syrup. *Recipe adapted from my 1-Hour Vegan Shepherd's Pie. I made this and instead of mixed frozen veg fried two finely chopped leeks with the onions and garlic. Then added frozen peas to the lentil veg mix. Love this recipe and all MB recipes I have made. I’ve made this one several times but I noticed today that the celcius temperature conversion is wrong. We are living in Europe and I so appreciate having the C temps in the recipe so I have one less step converting. Hi Jill, thanks so much for bringing this to our attention! It has now been updated. Thanks again! Your recipes are amazing and this one is no exception! I added the balsamic-glazed mushrooms and they added such a wonderful, almost meaty element to the dish. I didn’t use the maple syrup with the potatoes and I used only 2 tablespoons of avocado oil and the pie was still delish. With recipes like yours I’m showing friends and famiy that there’s no sacrifice for yumminess when eating vegan and healthy. Hi, I have red lentils in my pantry and I see the recipe calls for green or brown. Would red be ok? I really love your recipes, thank you! So delicious! I’m a huge sweet potato fan (I could eat them with every meal!) but my bf is not, so I did half sweet potato and half regular potatoes. Neither of us care for mushrooms, so I just left those out. We both LOVED this recipe. Can’t wait to make it again!! This was easy to make and smells amazing! I just didn’t have enough sweet potato to cover the top liked I hoped and couldn’t run out to get more. I was able to put a thin layer over the lentils. Would it be ok to mash more potatoes and layer on top of the thin layer tomorrow? I’m planning to serve for Thanksgiving. Can I make this the day before and cook it the the day of??? Would canned pumpkin work in this recipe? In place of the sweet potato? I’m not sure it would be quite the same and probably wouldn’t recommend it, but if you give it a try, report back on how it goes! I highly recommend including the mushrooms! I think it was a little sweet but they added a nice, hearty and “meaty” touch. Tasty!! Hey Dana, my sister requested this without mushrooms, but I think I’d rather make her a small portion separate without the mushrooms. Any thoughts on what modifications I may need for perhaps an 8×8 pyrex (to include mushrooms) plus 1 or more small (5″ diameter, 2″ high) crocks? Guessing the crock(s) will cook faster, but I don’t have much experience modifying baking times. Thanks. Hey there! Trying to plan ahead for Thanksgiving. I’m vegan and my little sister has celiac’s. Is this recipe gluten-free?? Hi Emily. I am not affiliated with Minimalist Baker. Yes, as written, and assuming all of the items you’d be using for it are not cross-contaminated–check the labels–yes, this is gluten-free. Gluten is in wheat, barley, rye and may be in oats depending on how they were grown (due to cross-contamination). It is also in any products derived from these (e.g. [barley] malt). Wheat is declared as an allergen on food labels (in the US). Under the ingredients list, look for the Bold font that says “CONTAINS: [allergens].” That’d usually my first step. Then I’ll read the ingredients. Also check to see if the label says “Made in a facility [or on equipment] that also processes wheat” (or any of the others). This tells you there is the potential for cross-contamination. I have celiac and will avoid products that may be cross-contaminated during processing. I also plan to make this recipe for Thanksgiving! My partner and I made this for dinner last night and it was absolutely delicious! We have more than enough leftovers for lunch AND dinner tonight, and maybe even lunch tomorrow as well, I am so pleased. We used 2 very large sweet potatoes (weighing just over a kilo for both) and it covered the top nicely. We also used 3 large portobello mushrooms and it worked out perfectly. The frozen veg was a great addition because all that prepping of veggies would have been too much on top of everything else and would have taken forever. We used a 500g bag of Heinz mixed corn, carrot, peas, and green beans and heated them in the microwave first for 4 minutes. This meal did take a while to make, but it was definitely worth it. We served it with a nice salad full of fresh lettuce mix and microherbs, cherry tomatoes, radishes, red capsicum, and cucumber. I poured a little of the extra marinade from the mushrooms over my salad and it was very nice. Highly recommended dish as always from Minimalist Baker! We hope you enjoyed it, Tiffany! I believe these plates are from west elm! It was really good!! I forgot to taste the sweet potatoes prior to maple syrup, and I’m pretty sure my taters would have been sweet enough without the syrup (with the mushrooms which added amazing flavor and texture!). Will definitely make this again. And thank you for the tip on the plates! We are glad you enjoyed this recipe, Tiffany! Hi Dana, Do you think it would be possible to sub something in for the mushrooms? I know they’re a big part of this recipe, but they’re the one veggie that I just don’t care for. Thanks! Super delicious! I made this tonight for a larger crowd of both meat eaters and vegan and everyone’s plates were wiped clean. I had a hearty garden salad on the side and the meal was perfect. Highly recommend. Don’t skip the mushrooms, they honestly make the dish! Thanks so much! I’ll definitely be making this again. Made this for my family tonight and they LOVED it. My husband isn’t the biggest fan of sweet potatoes but still cleaned his plate and asked me to make again in just a few days but to try with mashed cauliflower so I will do that next week! I just wished I had a bit of sage to sprinkle on the top, I love sweet potatoes with thyme and sage!! Thanks so much for the recipe! Whoop! We’re glad to hear that, Courtney! My family loved this meal! Went back for seconds!! I saw previous comments about 3 potatoes not being enough so I used 5 sweet potatoes for the topping which was perfect! I also had a lot of liquid left after cooking the lentils for some reason but I just drained it really well it was no problem! This was a hit! I loved the flavor and texture. We’re so glad to hear that, Lucy! This was delicious! I made this after work so I cheated a little and microwaved the sweet potatoes while I caught up on the news. I used 5 very large sweet potatoes and it was just enough to cover the top of the 9 x 13 pan. I think any less and you wouldn’t have a nice layer. I also used 2 large portabello mushrooms plus several smaller ones I had in the fridge and I would have liked more. Next time, I will make the pieces smaller so that I can get that perfect bite of mushroom/lentil/ sweet potato in every bite. I think this would make a great side dish when you are invited to someone’s house for dinner. The non-vegans will love it too. Thanks for this recipe! We are glad you enjoyed this dish, Jenny! Thanks for the review! Thanks so much for this recipe, and all your other great recipes too. Tried this recipe last night for my dad’s birthday (he loved shepard’s pie)…absolutely amazing! We all thought it was excellent. Thank you! Whoop! We are glad you all enjoyed it, Kat! I made this tonight and it was amazing. I made it with the portabello but I will make it without next time. Just a personal preference. There was extra liquid but I had no trouble draining it. I used a ladle full of the liquid for the potatoes since I try not to use oil when possible so was happy to have a little extra liquid. This will be my gluten-free vegan Thanksgiving dish. Dana, I have been gluten free and vegan for almost 2 years and you are the one that got me through the first month. I am so happy I found you before I decided it was too hard. I also love you are giving options for oil free. Tomorrow I am making your one-pot minnestrone. I will let you know how it turns out. Thank you for sharing your love of food with the world. We are so blessed to have you! I don’t usually comment, & have had touch & go luck w/all the vegetarian/vegan recipes blogged out there, but, WOW this was wonderful! I have to say, the lack of dairy is absolutely not an issue w/the richness of the coconut oil & quality taters. Didn’t use frozen veggies as I had a bunch of tri-colored beans, bell peppers, carrots, & corn from my garden so I used those (12oz total) & followed as directed (except I used 1 tbsp *dried* thyme). I have a feeling fresh veggies might have boosted the flavor, but this recipe is going in my file for any time of year, delicious! Easy to plate once cooled, just yum. Thanks for posting, so. good. Yay! We are so glad you enjoyed it, Betsy! I have never left a review before (although I probably should) but I had to this time, this recipe is easy, not very time consuming at all, has no silly expensive ingredients, and is the best recipe for a vegan meal I have found yet on the web. It was absolutely delicious, I made it with the mushrooms and I seriously can’t believe how well it turned out!!!!! I can’t thank you enough, I’ll be trying many more of your recipes and keeping this one as a weekly. This was deeeelish! I just diced the mushrooms and added in with my lentil mix- worked beautifully and saved a bit of time. I made this before and it was really good! I swear there was a link to a gravy to serve on it? I can’t seem to find that link and I didn’t save it! i added rice and spinach. I despise corn and peas. So added frozen cauliflower and carrots, nutritional yeast, and turmeric. The only problem is that the whole thing basically crumbled when I cut a square out from the baking pan. Do you have any tips on how to make the base more firm? Hi Em! I would probably recommend letting it cool longer before cutting. The longer it sits, the more it will thicken. Hope this helps! This was delicious. Made it with the mushrooms, and wish I had used more mushrooms because they were so delicious. It takes some time and effort to make, but in the end it was more than worth it. I may have done a combination of things wrong here – because the final product seemed dry and not nearly as tasty as I remember true shepherd’s pie being. The taste of the peas and the lentils seemed to overshadow the dish, despite adding the mushrooms. I did bake it for probably 10 minutes more than it called for due to the amount of liquid I saw boiling in the bottom of the glass casserole dish. I also kept it unbaked in the fridge for a couple of days before baking. I’m thinking the time and the over baking probably contributed to sucking the moisture from the veges. But like I said, there seemed to be a good bit of liquid in the bottom… Any thoughts/insights would be appreciated! This is my first EVER adventure with cooking vegan and it was AMAZING. I am not vegan, but am trying to cut down on meat for my health and for the environment, so this website is a great way to explore easy, affordable recipes. This recipe took a bit of love (I’m not a huge cook), but it turned out ridiculously good and I froze individual servings so I can have them when I need a quick dinner. Great and easy recipe! If cooking a frozen tray, how much longer should it cook in the oven? Or should I defrost first? What do you recommend? I would take it out the night before and refrigerate it to let it thaw! I’m surprised no one has had an issue with too much liquid. I would definitely back off the broth and add in more veggies and seasoning. A really great recipe to build on though. I SO wanted to like this. I made it just S recommend but was underwhelmed. I felt it lacked some flavor and wanted something to ‘hold’ the filling together. As a whole I feel like it lacked depth of flavor and sort of felt just like mixed veggies and lentils. A little bummed out that I didn’t love it BUT ON a positive note. – it was easy to make! I made this for the first time last night when we had company over. It was so good! I used baby portobellos and sliced them 1/4-1/2 inch thick. I also used dried thyme and yellow lentils as that’s all I had on hand. It was so good and my kids liked it. This looks so amazing! I was just wondering how you would make this recipe if you were using lentils from a can. Hi Savana! Just scale way back on the broth and no need to cook them as long! I have made this two times now for two different crowds and it is a win (even among the meat-lovers!). It’s a relatively simple dish with lots of flavor! The sweet potatoes are a fun twist! We had it once with the mushrooms and once without and both were great! Although a little time consuming to make, loved this recipe! I used 5 medium sweet potatoes but could have used one more. It would be useful if you could provide the approximate weight of the potatoes. Just made this with mushrooms chopped up in the lentils – so yummy!!! Such a good staple, quick and easy with cheap ingredients, will definitely be making this again. Omg. Yes. Just yes. If you’re wondering if you should add the optional portabello mushrooms? Yes to that too. Made this yesterday for a potluck at a paleo person’s house (my partner and I are both vegetarians). Everybody loved it. You guys are big up here in the tundra! And rightfully so–everything I’ve made from your site has been bang-up great–thanks for what you do! This is not a shepherd’s pie, why do vegetarians hide behind dishes made for carnivores. It is a vegetable pie, why can you not be honest and give it a name that honestly describes it…or include some lamb, hogget or mutton. I just made this and it was amazing! Next time, I’m only gonna make a few changes, more mushrooms( im a mushroom addict) and maybe one or two more sweet potatoes. Oh, but no green beans, only cuz i hate them:) Also, i want to try it with cauliflower mashed to leave out some carbs. Dana, its good stuff though! Thanks for sharing your changes, Melissa! Mine was flavorless also. I was wondering what I was missing everyone saying how delicious this is. I know you say Thanksgiving, but it was so good then that I’m totally making this to bring to Christmas. Hi, I’d like to try this recipe today. Would northern or pinto beans work? Hi Francesca! That should work! Made this for dinner (and lunches in the week) and my meat loving boyfriend absolutely LOVED it!! Didnt have portabellos but the crimini mushrooms i used still worked great! Thankyou for another great recipe ! wow! like always, delicious the mushrooms are perfects and give a tast so good!! So good! Made it as a test run for Christmas, and now I think I know what I will be bringing to eat and share for my family gathering this year. Seriously so, so, so good! Finally made this and we loved it! My husband said the mushrooms were a wonderful surprise addition to recipe. Thank you, Dana! Can’t wait to make this – and I LOVE the frozen veggie idea. Makes this a lot easier. ? I’ll post a photo and tag you on my IG. This was delicious!! I love the mushrooms! Leftovers keep and reheat really well. Just finished making this and it was delicious! Next time I make it I am going to dbl up on the mushrooms as they add a really nice meaty texture to the dish. So excited to freeze a portion of this to have later in the week. This was so good! Thank you!! I feel we will be making this for a long time and it is such a great dish to bring to a potluck, to work, etc. We used the mushrooms but didn’t have the balsamic vinegar (just used salt pepper and garlic powder while cooking) and it was fabulous even without the marinade! Good holds up well in fridge and reheats well. I made this last weekend and it was delish! I’m the only vegan in the house so I shared it with a vegan friend and she also raved about it. This is the first recipe I’ve made of yours, and I’ll definitely make more! Thank you for your hard work! Made this as one of our Thanksgiving sides, have a daughter who is vegan, it was really delicious would definitely make again….really recommend the mushrooms would have even enjoyed it with even more, the balsamic on them really added an extra dimension of flavor…yum! I made this last night! V.V.Tasty! The mushrooms alone, were delicious! I feel like there could be a lot of versatility in the vegetables one adds, but having the frozen ones are certainly handy! I have made several sweet and savory Minimalist Baker recipes now and they always turn out looking exactly like yours and I know they will always be tasty! I made this great dish and my non-vegan family kept commenting on how GREAT it was. I think several family members are getting ready to convert to vegan. Thank you Dana and John for the fantastic recipes. Made it to take for Thanksgiving and loved it! I made it salt and oil free. Next time I will use more mushrooms and more sweet potatoes. Thank you for such a good recipe. Hi Dana! I was wondering why you suggest using coconut oil rather than olive oil in this recipe. Does olive oil have the wrong flavour for it, or can coconut oil stand the heat better? We don’t keep coconut oil at my house, so I’m wondering whether it’s different enough than olive oil and worth buying as well. Excited to try this recipe, thanks in advance! I made it and even my non-vegetarian husband really liked it :) Delicious!! The mushrooms add a great depth of flavor, finally tried this and it is much better than the 1 hour version with the added mushrooms. I really liked this recipe but I had to add more seasoning to the lentil filling (I added homemade BBQ sauce, garlic-herb seasoning, sriracha) Just to add some flavor. I also topped the sweet potato with some maple coated pecans before baking it. This was so warm and comforting :) Loved it! Yummy! This was tasty. I love how hearty it is. I added a bit of vegan worcestershire to the filling. I didn’t have mushrooms but I bet that would have made the dish even better. It looked beautiful out of the oven. I would definitely make this again. I’ve been used to making the one-hour shepherd’s pie recipe so I was super excited to try this one out. The potato request is too little for the amount of coverage of a 9 by 13 baking dish. luckily I made more potatoes for another recipe but you need at least 3 lbs, I used 5 small and it was not enough to cover even half of the dish. I also used four cups of water band used a little bit of the sweet potato maybe a couple tablespoons to mix into the mixture because I didn’t want to lose the nutrients by draining the water. next time I might use three and a half cups of liquid. I sauteed my onions with freshly chopped carrots and then added frozen peas at the end. I made this last night in a trial run before T-Day, which I’ll be bringing to a house of meat eaters. I really loved it!! I want to pick up fresh thyme for the real dish and I will add a bit more salt so everyone will like it. My boyfriend gave it two thumbs up! I am planning on making this for Thanksgiving. I am going to bake it Thanksgiving morning at my house and then reheat in the oven at my family’s house in the afternoon. How would you suggest reheating? Also, would you recommend foiling over the top when reheating to prevent the potatoes from drying out? Thank you! I made this last week, and my carnivore husband absolutely loved it (as did I, of course)! In fact, he even said next time I could add more mushrooms!! I’m not a big fan of balsamic so I marinated my mushrooms in gluten-free soy sauce, and it still turned out delicious. Yet another fantastic recipe Dana! Layered. Not sure balsamic should be layered in casserole with mushrooms. Just came out of oven, very pretty. Made this with ground chicken from our farmer and was pretty yummy! The mushrooms were the fav additive (used cremini); now I know what balsamic does to them–will do this again for sure. Mixed both sweet and yellow potatoes together (on hand) and so yummy with eeeexxxxtraaa coconut oil, butter and salt (a little too minimal on those Dana!) Found out that these ‘pies’ are called Cottage Pies when anything but lamb or mutton is used—how about that! I’m not terribly fond of lentils, is there something I can use as a substitute? Maybe another bean? What about something like split peas? Otherwise, maybe white beans? I made this tonight just like it says and it was excellent–first bite I was like thi is really good! My meat eating husband ate a huge serving too! Your recipes are great. Thank you. I just made this, and it’s SO good. Would highly recommend, thank you for another amazing recipe! Used to live in London for 3-4 years (Brixton). a friend of mine cooked Shepherd’s pie for me and it was really good but this one looks different. I just have to try this, though i’m afraid my cooking skills are not that great, at least in real life. I cook like a pro in papas games though haha. Thanks for the amazing recipe. Being temporarily without an oven, I made a version of this in the crockpot because I couldn’t wait. I used 1 cup of lentils so that it came out more like soup. I cut up the sweet potatoes rather than cooking and mashing. I only had cremini mushrooms so I caramelized them. I think the 40 gr seemed a little small. I layered according to directions. After 20 hours of cooking on low, I was very pleased with the outcome. 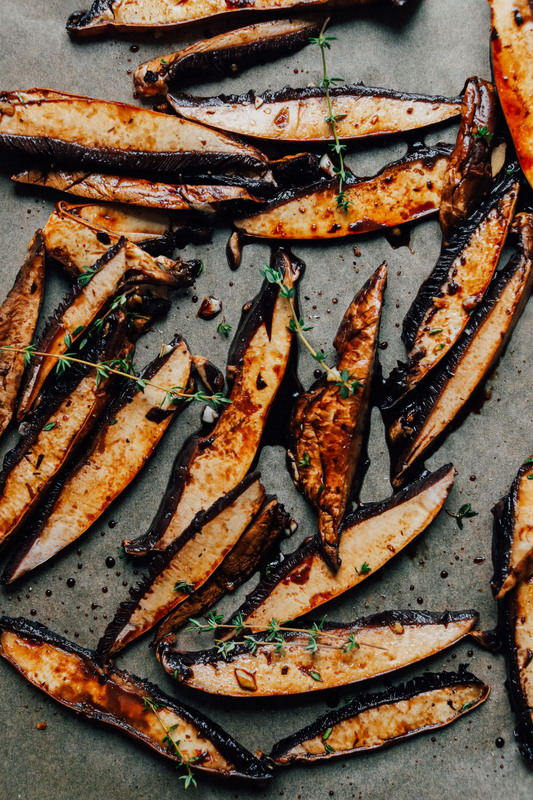 The balsamic vinegar raised the thyme flavor to another level. I had 4 bowls today and loved each one. Thanks. I gave it 4 stars as I have yet to make and bake it, but I am sure it will be a 5. I have ALWAYS wanted to make something like this! Your take looks so delicious. I will be trying out my own rendition, but it will be drastically different from the typical vegan shepherd’s pie! Hi Dana! I love your website and try a bunch of things, but just to let you know I made this as our dinner tonight (writing from Portugal) and we loved it! It’s so delicious and hearty, it was really good! I was going to ask this exact question! I am planning on making this for Thanksgiving. I am going to bake it Thanksgiving morning at my house and then reheat the entire thing in the oven at my family’s house in the afternoon. How would you suggest reheating? Also, would you recommend foiling over the top when reheating to prevent the potatoes from drying out? Thank you! Maybe lightly tent with foil. Otherwise you should be good! Made this last night and it was delicious! Added a touch of paprika for personal preference and served to my meat eating friend who loved it so much she went back for a second portion later in the evening! Prepping meals that I can freeze for my family because next week we are having our 3rd baby (3 babies in 3 years!). Would you bake the dish before freezing it, or, would you freeze it, and then bake it? SERIOUSLY, EARNESTLY, THANK YOUUUUUUUUUUUUUU Dana. Thanks, Elle! Hope it was delicious! My life would be SO much easier if I liked mushrooms but I just don’t, at all! So, I’m thinking eggplant would work really well instead. Looking forward to trying this recipe! This looks great. But what would you suggest as a substitute for someone that doesn’t like sweet potatoes, lentils, or mushrooms?? OH and peas and green beans? Thanks love your stuff. Yeah just can’t stomach any of that stuff. Oh, Janet Butters. Ms. Butters. You’ve really stumped me this time. My suggestion would be to make something else! What sort of pot did you use to cook lentils? I don’t have any Dutch ovens or enamel cast iron. Thanks! Just use a large pot. This recipe works great for portion and freezing, I have done it twice already with the one hour shepherd’s pie. After baking refrigerate till completely cold, it will slice up and portion beaitifully! This is a fantastic recipe can’t wait to make this version! Do you think this would be OK to make and freeze for meal prep? I would also like to know! Meal prepping this weekend for two weeks and need something I can portion and freeze. I had surgery in September and I cooked several meals and portioned them into individual servings in preparation for my recovery. One of the meals I cooked was the Vegan Shepherd’s Pie from this website (very similar to this recipe, but with white potatoes). It froze and reheated wonderfully. I would imagine this one would give the same results. Can I just say something here? 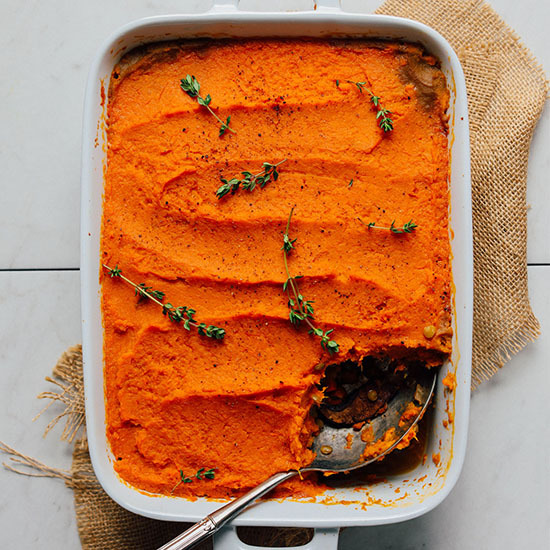 Whenever I see shepherd’s pie on the blogosphere, the versions I see always look kind of soupy and honestly just bleghh. THIS, on the other hand, looks pretty darn amazing. Would you say the flavors taste much like “traditional” shepherd’s pie? I haven’t had it in so long, but I used to really love it. So kind! It doesn’t taste like a super traditional shepherd’s pie as there’s no meat. But the structure is definitely there, and I think the mushrooms add another wave of flavor that’s delicious! What kind of side dishes would you suggest with this? Any salad really, but especially this Garlicky Kale one! Do you have any advice for making this with canned lentils? I can’t wait to try it! It looks amazing! 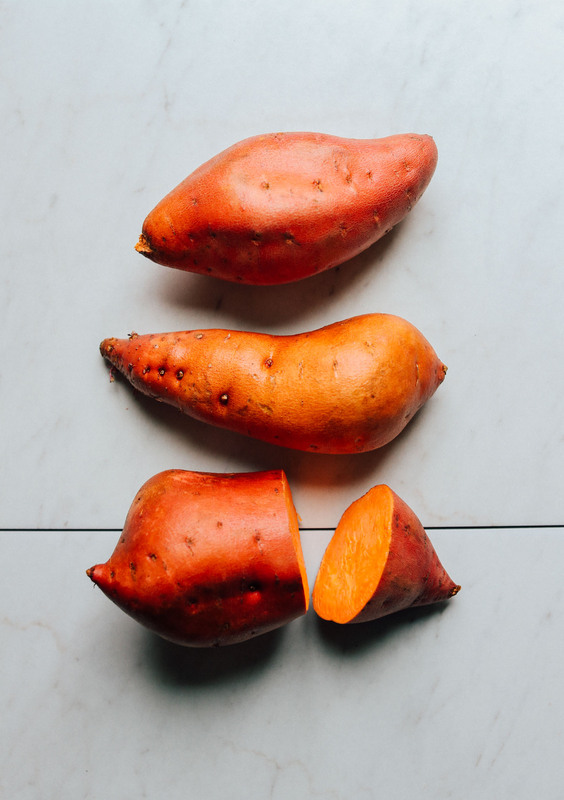 Could you substitute regular potatoes for sweet potatoes? Would you have to make any other adjustments? Bronwyn, you can use canned lentils, just scale way back on the broth and no need to cook them as long! How many cans of lentils would you use? What could you use instead of thyme. I really dislike it and everything tastes like it too. I might have to make this for Thanksgiving. It looks so good. I will just skip the mushrooms when I make it. This sounds amazing-thank you! I do something similar but I use cauliflower mash for the topping and it really works. Can’t wait to try it with sweet potatoes instead! I would prepare it up until the point of putting on the sweet potatoes. Then refrigerate covered up to 2 days. And bake on the day of. Hope that helps! 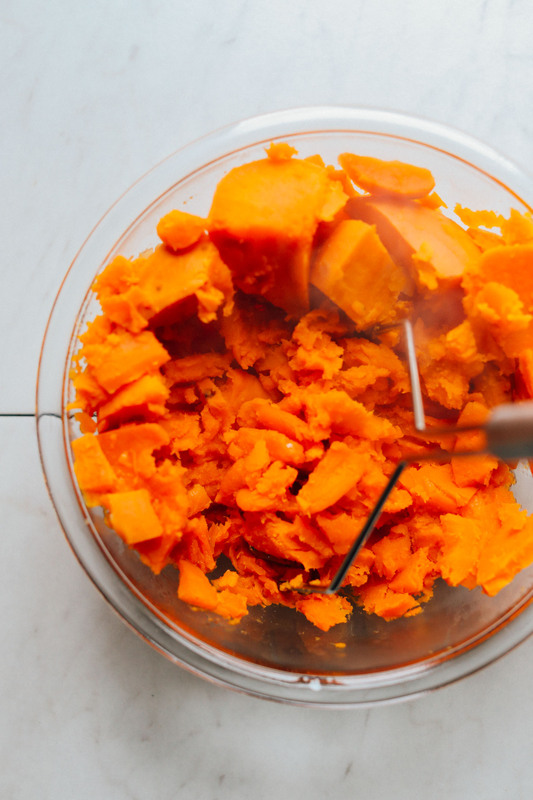 For your make-ahead advice, do you recommend cooking and mashing the sweet potatoes ahead of time and refrigerate separately until time to bake? I generally love your This recipes, with this one being no exception. However, I am unpleasantly surprised at your use of frozen vegetables. When I make this, I will surely use fresh veggies of my choice. Thanks for the feedback. I used frozen because it comes in a medley, which simplifies the ingredients list and prep (and saves time). But of course, use whichever you prefer! Fresh or frozen are both fine. I absolutely love all of your recipes, never disappointed, in fact I’ll take something of yours to a gathering without even trying it first! For this recipe though, I too was thinking of using fresh veggies rather than frozen. I usually find frozen somewhat tasteless…So my guess for prep was to steam them till just almost tender, so they can cook the 10 mins with the lentils without becoming mush. Is that what you would do? I’m thinking fresh might take a tad longer than 10 mins. I love that she used frozen veggies! Its SO hard for me working full time to come home and commit to cooking. I’m so grateful that Dana makes these intricate recipes more feasible (frozen veggies example). This is exactly what I depend on from Minimalist Baker to help me cook healthy vegan meals for myself. If you are lucky to have extra time on your hands, you can easily make it with fresh veggies. Not all of us have that luxury though! I’m a meat-lover so I don’t usually get drawn in by vegetarian dishes, but this recipe is an exception! Definitely filing this away for the holidays with a vegetarian in the family :) Thanks for sharing this! Hi Deborah! I’m not sure about that. I think the filling could be made in the crockpot, but I’m wondering if the mushrooms and sweet potato wouldn’t require baking. Let me know if you give it a try! Any recommendations for making this in s crockpot? I’d love to make this for a group potluck. I made it without the crockpot and it’s amazing! Thank you :) I followed the recipe exact and was sure to add the portobellos.